1. MATRIX Biolage Polishing Hair Scrub ($23/7.6oz @ jcpenney.com) – this pre-shampoo sugar scrub was made to clean the scalp and hair and I’m a fan of these pre-products lately. This one smells like fresh cut lemons. 2. WEN 'Spring Honey Lilac' eau de parfum ($109/3.4oz @ chazdean.com) – I think I may have found my springtime scent! Living in California, I don’t come across lilacs at all so it’s nice to be able to smell them again on the regular with this frag. 3. METHOD Foaming Body Wash in Ruby Orange ($4.74/18oz @ walgreens.com and target.com) – no waiting for lather with this one! Just a few pumps of this in the wash cloth and you’re ready to go. And the scent is really nice and uplifting. There is truly something out there for everyone’s hair texture. 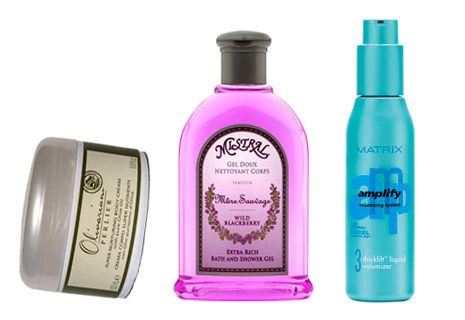 Change your look by changing your styling products and here are a few to get you started. For those of you that feel comfortable using a gel, TERAX Styling Gel fits the bill. You get a medium hold with special care from Vitamins B & E. $12/5oz @ sephora.com. A good friend of mine can’t seem to let go of the 80’s and her big hair. Deciding to go with it, I asked her to put down the Aqua Net in the pink can and try SUDZZ FX LockUp Firm Hold ($16.98/8oz @ sudzzfx.com). Straight from her mouth – “it holds and helps me style better than the pink stuff.” Need we say more?